For the 22 Mens Open Elite teams registering to play in this year's NACBAIT, this weekend represented the opportunity to take the court against the best Chinese teams from across the US and Canada. Pool play was a rigorous ordeal of upsets, rivalries, buzzer beaters, and overtimes. It was a major accomplishment for the 12 teams who managed to survive Saturday to advance to Sunday's Medal Round. In First Round action: Jeffrey Lee led #9 Washington CYC A to a 39-28 win over the talent depleted #8 Texas Ballstics, Mike Yih (15 points, 4 steals) orchestrated the #5 Boston Hurricanes AAU win over the #12 Toronto Kagers, #6 Toronto survived an all-Dragons showdown with # 11 Chicago 40-33, and the hometown #10 Boston Knights (led by Joe Brush's 15) somehow escaped with an upset win over the #7 NY Rockits AIA 30-28 in one of the closest games of the Tournament. In the Quarters, #1 Seattle faced #9 Washington CYC A. Seattle used the sardine-packed court and their towering frontline to their advantage by taking away all of CYC's corner and baseline attacks. Song Cun and Tim Wang sizzled from the outside, while Jim Shih and Kyle Kiang patrolled the inside for the Bladerunners. CYC fell behind huge early and couldn't get on track until 3 minutes left when Bobby Hsieh (2 consecutive triples) got them back within five. After that, it was all a matter of sinking free throws and Seattle won 50-36. The best game of the QF's was the Hurricanes meeting up with the NY Cruisers. The Cruisers' main weapon Tony Hu was suffering through a shoulder injury all weekend long, so they were forced to look to other sources for their buckets. The team concept worked for NYC as Boston trailed by 1 at the half. This game saw numerous lead changes throughout the second half. Guard Mike Yih (12 pts, 3 steals) would hit a 3, and George Chan (14 & 12) would answer with a tough inside move. With 2 minutes to go, forward Johnson Lam connected on one of the toughest drive bank shots I have ever seen to give his Canes a 4 point cushion. NY was unable to chip away at the lead, and the Canes advanced to the Final Four 50-46. At the same time, there was an equally intriguing game going on between the undefeated #3 NY MOW and the #6 Toronto Dragons. The entire Maximum Output team was shooting well in the first half, but Albert Tseng (9 points) singlehandedly kept his squad in the game as he was the only consistent weapon for the Dragons. With under 10 minutes to go in the game, MOW was up by 10. With nothing to lose, Toronto put in 19 yr old rookie Kenny "The Microwave" Ao. The Microwave heated up quickly as he produced 10 unanswered to make it a game. The score remained knotted up at 27 for a few minutes as the NY isolation plays weren't working, and Toronto fell cold once again. Finally, Jimmy Cheung and Jordan Chiang stepped it up to give the Dragons a 36-30 win and a return to the Final Four for the first time since 2003. The final game of the round saw the Boston Knights A run into one of last year's Finalists, the SF Duke. The Knights managed to keep it close up through halftime. But in the second half, the Frisco depth made a huge difference as they cruised to a 60-42 win. Dennis Yuen registered 13 for SF and Joe Brush had 18 for the Knights. The Semifinal games exemplified this year's West Coast's dominance, as both games quickly turned into blowouts. San Francisco didn't travel 3100 miles for nothing. So when they took the court for their game, they were all business. When the Duke met up with the Toronto Dragons, it appeared that Toronto was not accustomed to facing the high caliber perimeter defense employed by the Duke. SF was up by over 20 before halftime, and eventually doubled Toronto's score 67-32. Dennis Yuen led the Duke with 16, while Gary Cheung netted 8 for the Dragons. The other Semi meeting between the Canes AAU and Seattle was slightly closer in the scoring column, but Seattle had control of the game from the opening tip. With all 3 of their NACBAIT Top 25'ers- Song Cun, Kyle Kiang, and Jim Shih- playing at the pinnacle of their game, Boston was no match for the Bladerunners. The top slam dunk of the day went to 6-8 Kyle Kiang as he stole the ball, and jammed one home on a sweet fast break oop that drove the crowd nuts. Seattle advanced to the finals 50-38. PG Song Cun had 16 for the Bladerunners, while All-Tournament selection Mike Yih had 12 for Boston. The big game was slated for Monday at noon at the Wang YMCA in Boston's Chinatown. It all boiled down to a rematch of last year's championship game- the #1 Seattle Bladerunners and the #2 San Francisco Duke. These two teams came to the Tournament with the two most talent filled rosters, so it was no surprise to see them both arrive here undefeated at 5-0. From the beginning, Seattle seemed to be the team with that extra bounce to their step. Kyle Kiang did his thing- posting up, popping some 3's, and slashing in to jam home a putback to get the crowd started. Song Cun always has something for the audience to write home about, and early on in the game he had a neckbreaking double crossover pullback jay that left everyone in the gym speechless. But despite Seattle's fancy play, SF was still only down by 4 at the half 24-20, thanks to some defense stretching 3's from center Henry Hong (2 triples, 8 points) and legendary 2-guard Conant Chi. In the second half, Ryan Dunn finally found his stroke after a cold shooting first half. Ryan dropped in 13 on a bunch of midrange jumpers to get Duke back in the mix. After All-Tournament forward Dennis Yuen (10 pts, 5 rebs) stole the ball and headed down for an easy bucket, the score was once again all knotted up. But Seattle still had a little bit left in their stash of secret weapons, as they went to rookie swingman Austin Yuen (17 pts, 4-4 ft's) time and time again. SF was forced to foul down the stretch, but the Bladerunners were more than efficient from the charity stripe. 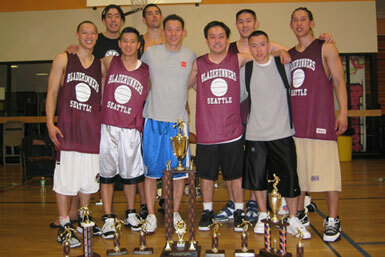 Any glimmer of hope was destroyed when MVP center Jim Shih (16 points, 8-10 ft) grabbed an offensive rebound then sank 2-2 from the line to give Seattle the game and the 2006 NACBAIT title 57-48. That makes 3 of the last 4 for Rich Yu and the Seattle Bladerunners. See you guys in Mesa.